I've climbed all the 4000ers in Lochaber, so wasn't really too bothered about doing them again. My brother, however, had done on Ben Nevis. I said to him at the start of the trip that if he wanted to do Carn Mor Dearg and Aonach Beag then they were only a short walk away from our route, but both of them don't lie directly on our path. Aonach Mor did, however, so he settled for that. We started at Torlundy at 10am in reasonable weather. The walk up to the CIC hut from there is always a nice one, and the terrain was very pleasant. Got to the CIC hut around 11.30am (my brother's fitness isn't the best) and marched towards Tower Ridge. Skirted round the bottom of it for the - frankly - arduous battle up Observatory Gully. If anyone's ever been up there you'll know how energy sapping it is... However, our quarry (last winter's snow) lay up in the higher reaches of the gully, and armed with my 100m tape-measure and heavy rucksack I scuttled up, always having to wait on my younger brother to catch up. I knew at this point that the gondola back down from Aonach Mor was not going to happen, as it finishes at 5.00pm (ish). 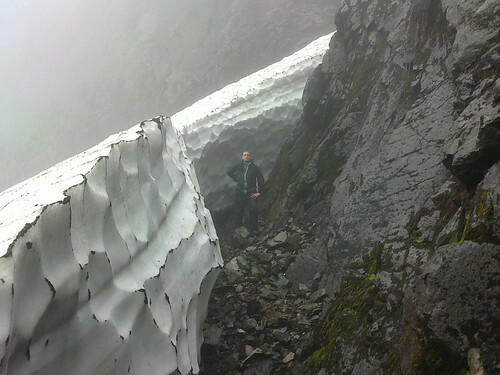 We reached the snow (1130m) eventually, and found it to be ~95m long, and still reasonably deep (in the region of 6m in the middle I would say). On the way down we popped across to Point 5 Gully, to photograph the snows there. This is the snow you can see from the road at Torlundy. From there we retreated down the gully again and round the bottom of the north-east buttress, across the little lochan at the head of Coire Leis and up onto the Carn Mor Dearg arete, around here. Coming up the final gully was a bit of a scramble, and I assisted my brother by climbing to the head of the gully and throwing him some rope down. Good move! Never underestimate the handiness of rope if you're climbing steep slipply grassy gullies! From there it was a case of follow the line to the bealach between Carn Mor Dearg and Aonach Mor. This route was pioneered(!) a couple of years ago when I did the route with Blair Fyffe, who has a sniffer-dog instinct for picking out an easy route. 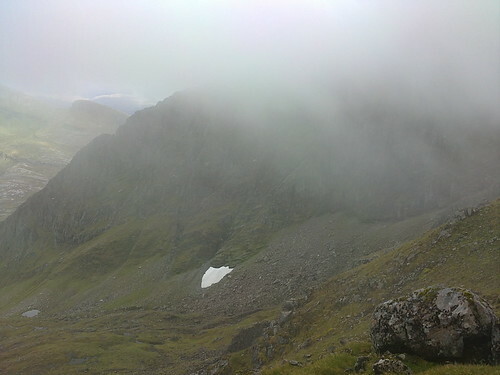 The path from the unnamed bealach at 830m to the summit plateau is steep, but pleasant. It gains height quickly, and before too long we were on the plateau. I sped across to the edge of the corrie to see the snow-patch that lies in the shadow of Aonach Beag's north face, here. This patch has been present since 2006, and is approaching 4-years old. 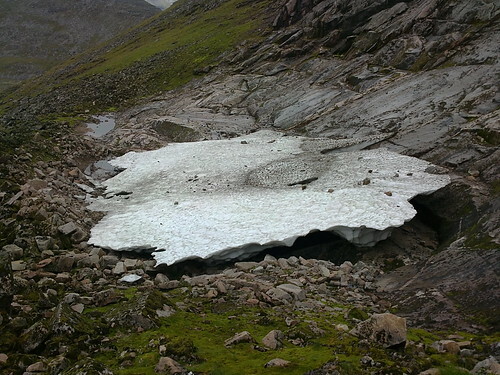 In 2007 & 2008 it was the largest patch to survive 'til winter, despite it sitting at an incredibly low altitude of 955m. We walked in thick mist to the top of Aonach Mor, where we had our first Munro of the day, despite having climbed 1600m thus far! Fatigue had well-and-truly set in for my brother by then, so I let him off the final 120m descent and ascent of Coire an Lochain, which also held some snow. Again, I dropped from the summit plateau (where it's not so steep) and came into Coire an Lochain here, as it's virtually impossible to enter it directly because of the sheer cliffs. There I found a reasonable patch behind a protalus rampart, which is invisible from below, as you'll see from the picture. The rampart shields it from the view below. 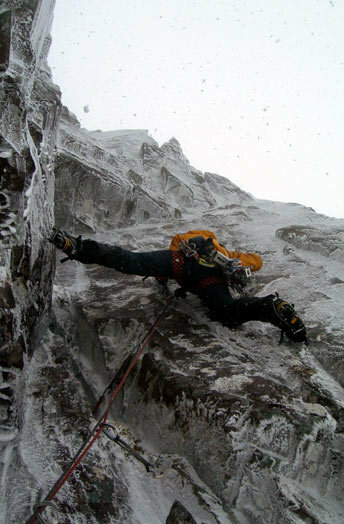 From there I had two options: head across to Climber's Col, or the more direct Easy Gully. Easy Gully is, in wet weather, very slippery. It's also steep, and a slip there could result in a sticky end. However, I've done it before when it was dry. Also, I had given my brother the rope, and he was waiting at the head of the gully with all 30m of it unfurled and waiting! In the end I came up without too much of a problem, although the bouler I kicked down by mistake went for hundreds of metres before coming to a stop. From there it was down the Goose and then the mountain bike track to the car park. The sting in the tail was the 2.5-mile trek back to the car park at Torlundy. I so didn't need that, and nor did my brother, who subsequently told me he lost 5lbs during the course of the walk, despite eating and drinking copiously. WOW! what a route and a half that is! How did you find doing it? I have been looking at doing Aonach Mor, Aonach Beag, Carn Mor Dearg and the Ben in a single day but thought that it would be a little too much to do, probably adding on another couple of hours or so. Would love to see photos of this one, or have I missed/not seen something? Fascinating stuff. Have you been wandering round the Cairngorms for snow patches too or does that fall to someone else? Very very interesting stuff to me Do you have any more photos from the day? I would love to see the set. Milesy wrote: Very very interesting stuff to me Do you have any more photos from the day? I would love to see the set. I have an online archive, which you can see here. The photographs and videos of that day are here. The patches this year are down on 2007, 2008 & 2009. Huge volumes of snow fell, but the normal long-lasting sites mostly all missed out because little of it came from the SW. Most of the big snowfalls this winter had an easterly direction, which is really very little use to corries facing NE! Also, snow blowing in on a SW wind is generally driven in at pace. It doesn't need Einstein to realise that snow blown in quickly (i.e. large quantities) will accumulate faster than snow with little wind. Freeze/thaw is also important. Again, this year there was very little indeed. Temperatures in the Highlands stayed below freezing for weeks at a time, and a lack of SW or S hairdryers to thaw the pack ensured it stayed unconsolidated. When the inevitable warming came, the snow was not very resilient at all. Paul Webster wrote: Fascinating stuff. Have you been wandering round the Cairngorms for snow patches too or does that fall to someone else? I haven't been wandering round there myself this year so far, but I co-ordinated a Scotland-wide survey that others took part it. One of the areas was the Cairngorms. Excellent read. I don't mean to sound stupid but is that a hobby, monitoring thwe snow patches or part of your work. Good route in any case. Very interesting stuff- thanks for that. I have been coming to the Nevis Range in July for the past 3 years and noticed significantly less snow this year on the sides of Carn Mor Dearg, Aonach Mor and Ben Nevis that the previous 2 years. Very interesting to hear the reasons behind this. I also believe though that there was more snow in the Cairngorms in July than for some time. Was this partly due to the easterly flow you describe, and the fact that the Nevis Range is in the west and Cairngorm further east, that Cairngorm simply got more than the Nevis Range and that the Nevis Range therefore had a drier winter? As Nevis is usually so wet because of the prevailing westerlies, and the lack of these last winter? Barnety2000 wrote: Very interesting stuff- thanks for that. I have been coming to the Nevis Range in July for the past 3 years and noticed significantly less snow this year on the sides of Carn Mor Dearg, Aonach Mor and Ben Nevis that the previous 2 years. Very interesting to hear the reasons behind this. I also believe though that there was more snow in the Cairngorms in July than for some time. Was this partly due to the easterly flow you describe, and the fact that the Nevis Range is in the west and Cairngorm further east, that Cairngorm simply got more than the Nevis Range and that the Nevis Range therefore had a drier winter? As Nevis is usually so wet because of the prevailing westerlies, and the lack of these last winter? There were a couple of big snowfalls during the winter that came from the north-east. The Cairngorms in particular benefitted, whereas regions farther south and west missed out. Even at a regional level some of the conditions can be extremely localised, to the extent that one mountain (the more northerly one) gets snowed on but the next one (farther south) misses out. A fine illustration of this is shown in this photograph from June 16 2008. Look at the fresh snow on top of Braeriach (shown by the footprints), yet Cairn Toul, just a couple of kms farther south, has virtually none. The fact of the matter is that the west did less well in terms of snow-fall, as most of the snow came from the east. Obviously the farther west the front moved, the less snow it had to deposit on the hills. This is only my theory, mind, and is not based in science! It has melted often. Just recently, for a run of 4-years, no snow survived at any of these sites (2003-06). The situation reversed in the last 3-years, and snow has been ever-present on Ben Nevis and Aonach Beag (though not Aonach Mor) since late 2006 (when the first lasting snows of winter fell). This year looks decidedly touch-and-go. Milesy wrote: Ye have no faith in climate change sir Evidence shows there was glacial ice still as little as a couple hundred years ago. Does it? I don't think so! The 'Little Ice Age' theory died in 1985 with the work of Sheila Rapson, a former student of David Sugden. He published an account (based on lichenometry) in the Cairngorm Club Journal in 1977 called Did glaciers form in the Cairngorms in the 17–19th centuries?. Rapson's article, published 7-years later in Boreas, rejects Sugden's work. Unfortunately, Rapson's counter-article didn't get the coverage it warranted as who wants to hear a beautiful hypothesis slayed by an ugly fact? So... the next time you hear the old 'glaciers in Scotland during the Little Ice Age' tale, you can tell them it's all a pile of poo! No need to retort with such a dry response. It is all friendly on here. You cant counter claim with a single piece of research, just as a single piece of research to the opposite. I am not talking about full blown ice ages or glaciers. 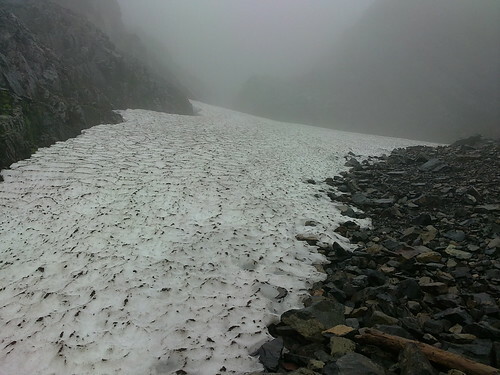 I am saying it is short sighted to think that permanant snows even in the form of non moving glacial snow could not have existed at the higher altitudes in recent times. Norway is a good comparison of how they exist still at altitudes just higher than our own highest points. Sorry, it wasn't meant to be dry! Must have just come out like that... The only reason I queried your post was that you referred to 'evidence' of glacial ice a couple of hundred years ago. I just wondered what that evidence was. It's entirely possible that I've not come across it. On the broader point, it depends on what you mean by 'glacial ice'. You could argue that permanent snow and glacial ice are indistinguishable, but I prefer to use the terminology 'perennial snow' when talking about such things. Glacial ice suggests, I believe, that the snows are in the process of becoming glaciers. That's just semantics on my part. 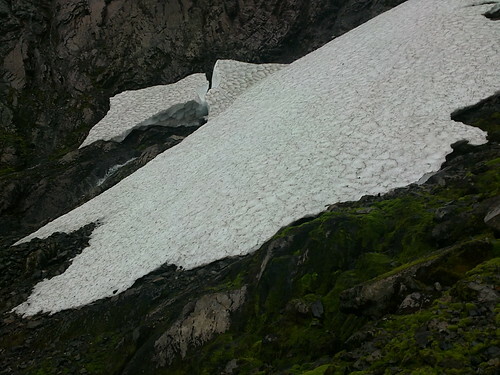 Certainly up to 1933 the snows at Braerich and Ben Nevis were considered permanent. Accounts from that year suggest that snow was ever-present from at least 1840 on Ben Nevis, and 1864 on Braeriach: possibly much longer. What is certainly true is that there are a lot of accounts from all over Scotland which appear to show far more snow in 1600-1930 than years since. Glaciers, no. Perennial snow, yes! That's a fantastic report, and unique in it's purpose and detail of the snow at the moment and in the past. As others have said, it's fascinating stuff.